The main reason I take the time every October to give National Novel Writing Month advice is because I’ve done it many, may times. I’ve also never lost. I only tell you that because I hope my advice, and what I’ve learned so far (this coming month will be my 8th round) can help you win, too. I don’t do it for the win. I just love to write. Here’s what 7 years of literary insanity have taught me. 1. Writing chronologically is not a requirement. 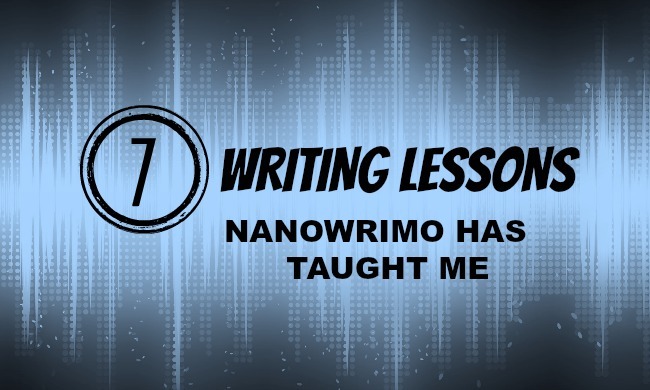 During events such as NaNo, writing your story in order from beginning to end, unless you’ve done a lot of detailed outlining, is absolutely not necessary. In fact, trying to do so might even slow you down. If you have an idea for a specific scene but your story isn’t “there” yet, just skip down a few lines and start writing that scene anyway. You can go back and fill in the gaps later. Much, much later. 2. Your inner editor will start yelling; ignore her. You’re going to misspell words, and write sentences that make no sense, and run on for an entire paragraph without any punctuation. You’re going to spell one character’s name five different ways on the same page or forget their name altogether. Your inner editor is alive and well, and you’ll know it. Ignore that voice in your head begging you to fix all the words marked with red and green squiggly lines. Just keep writing. Don’t look back. 3. Take breaks even when you’re on a roll. There were a few days during a WriMo a long time ago where I unintentionally ended up sitting at my desk writing all day without stopping. Do not do that. It’s nice to pull yourself out of reality for a little while, but doing it too much at a time will really mess with your head. Plus, you need to do normal real-world things like sleep and eat and shower, and you probably have to go to school and/or work. Etc. 4. Try not to obsess over your word count. It’s much easier to dive into a story and crank out a lot of words at once if you’re not constantly glancing down at and/or updating your word count. If you can, try to limit yourself to updating your word count only once or twice a day, depending on how you break up your writing time. Even though the point of a WriMo is to write – a lot – the quality of your story still does matter, and the more time you spend stopping to check, the less productive you’ll be. 5. A few slow writing days won’t stop you from reaching 50,000. It’s very easy to get discouraged when you have a particularly rough writing day, especially if it’s your first WriMo or you’ve never won (hit 50,000 words before December) before. One bad day isn’t going to throw you off too much. Sometimes our brains just need time to align themselves after some overuse. You will get back into it and you’ll make up that “lost” day in no time at all. 6. Force yourself to write only when absolutely necessary. You can’t force creativity, and unless you’re scrambling to meet a deadline of some kind, you shouldn’t ever try. Forcing yourself to write when you’re blocked isn’t quite the same as trying to push through those first 500 words – what I’ve found to be the magic number it takes to really get into “the zone.” If you’re just not in a good mental place, don’t push yourself too hard. Everyone has good and bad days, and on those bad days, it’s okay to take it easy. 7. Don’t just stop when you hit 50,000. Reaching the “end” is a great feeling, but just because you’ve hit the minimum word count to score a NaNo victory doesn’t mean you have to stop, or that you should. If you’re at 50,000 and you’re finished with your story, okay, no problem. But if you have more to write, write while you’re still riding on that momentum! I’ve finished NaNo with 70,000 words before (please don’t ask how, I have no idea). There is no limit. But be honest, don’t fudge your numbers. Need more NaNo Prep help? Start here. Next postCan You Relate to These Major Blogging Struggles?